Abstract: Objective To investigate the expression and correlation of apurinic/apyrimidinic endonuclease 1 (APE1) and programmed death ligand 1 (PD-L1) in human laryngeal squamous cell carcinoma (LSCC). Methods We collected 60 LSCC tissues and 30 adjacent mucosal tissues and detected expressions of PD-L1 and APE1 and analyzed their correlation with each other and with clinicopathological factors. Hep-2 cells were transfected with siRNA liposomes, lipopolysaccharides[nuclear factor κB (NF-κB) agonists], and PDTC (NF-κB inhibitor). The expressions of APE1, PD-L1, NF-κB, and pNF-κB were detected by Western blotting. Results The expressions of APE1 and PD-L1 mRNA were significantly higher in LSCC tissues than in adjacent tissues (P < 0.05). There was a positive correlation between APE1 and PD-L1 mRNA expressions in LSCC tissues (r=0.37, P < 0.01). The expression of PD-L1 was related to the tumor location, and the level of PD-L1 mRNA was significantly higher in glottic carcinoma than in subglottic and supraglottic carcinomas (P < 0.05). APE1 mRNA expression was associated with lymphatic metastasis (P < 0.05). 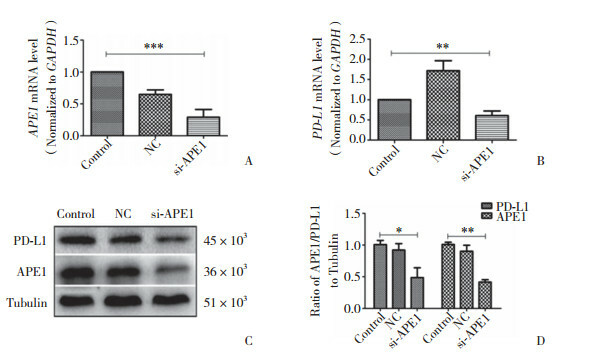 The levels of APE1, NF-κB, pNF-κB, and PD-L1 were down-regulated in Hep-2 cells transfected by APE1-siRNA (P < 0.05). PD-L1 and NF-κB were increased and decreased after treatment with lipopolysaccharides and PDTC in a certain concentration range, respectively. In APE1-siRNA transfected cells treated with lipopolysaccharides, NF-κB and PD-L1 were down-regulated compared with the control group and the lipopolysaccharide-only group (P < 0.05). Conclusion Compared with subglottic and supraglottic carcinomas, glottic carcinoma may show a better response to PD-1/PD-L1-based immunotherapy. APE1 regulates PD-L1 expression through the NF-κB signaling pathway. Combined determination of PD-L1 and APE1 expressions may have potential clinical significance in inhibiting LSCC growth. LI M, WILSON DM. Human apurinic/apyrimidinic endonuclease 1[J]. 2014, 20(4): 678-707. DOI: 10.1089/ars.2013.5492. KAN G, DONG W. The expression of PD-L1 APE1 and P53 in hepatocellular carcinoma and its relationship to clinical pathology[J]. Eur Rev Med Pharmacol Sci, 2015, 19(16): 3063-3071.